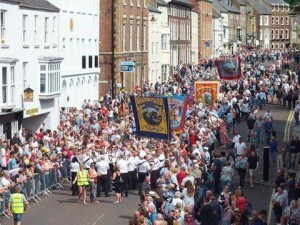 Every summer, thousands of people turn out to celebrate the area’s mining heritage and links to the trade union movement. 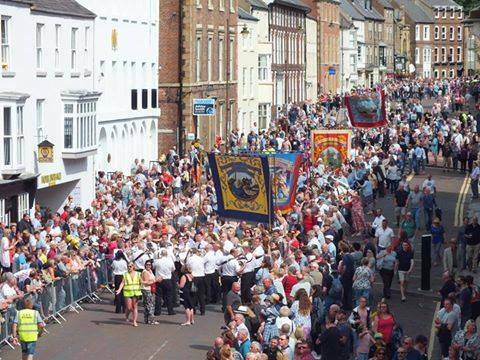 The Skelmanthorpe Band participated in the 131st Durham Miners Gala on Saturday 11th July 2015 where they represented East Hetton (Kelloe) and Quarrington Hill. The band paraded with lodge and union banners through the streets of Durham to the city’s racecourse, entertaining the crowds with traditional marches and more contemporary pieces of music such as ‘Greased Lightning’, ‘Fat Bottomed Girls’ and ‘Don’t Stop Me Now’. A focal point of the day was the County Hotel where local dignitaries and invited guests greeted the bands from the hotel balcony. It was here that The Skelmanthorpe Band stopped to play its entertainment piece, ‘Don’t Stop Me Now’ before continuing its march to the racecourse. Mid afternoon, after the trade union speeches and the miners’ service in the city’s cathedral, The Skelmanthorpe Band marched and played its way back to its assembly point at the New Inn pub where the organisers from Kelloe and Quarington Hill expressed their grateful thanks. It was a great day out and the band thoroughly enjoyed themselves! See a selection of photos from the day.